An example of a previously unrecorded date for the Hhibernian Bank One Pound Tokens turned up in Whytes auction last week. 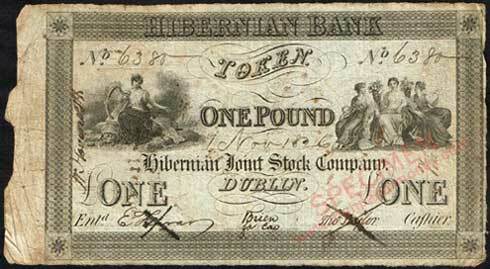 Hibernian Bank Token, One Pound 1 November 1826, No. 6380. This brings the known number of dates for the One Pound tokens to three. 10 July 1826, 1 Sep 1826, 1 nov 1826. Others may turn up in due course as more issued notes come to light.